Monogrammed Backpacks and Lunch Totes are IN! We are super excited about this personalized preschool sized backpack in 3 adorable patterns. This preschool sized backpack is sized for the littlest tikes through about kindergarten. 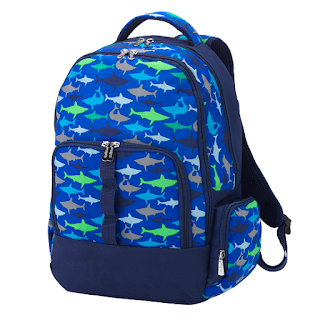 The regular sized backpacks are a bit too big for the little ones, so we really like this one. Hopefully, their homework won't outdo the amount of space in this backpack that is perfectly sized for them that can go from daycare or camp through kindergarten. We love that this personalized drawstring backpack is back for this school year. The uses are endless. Our own kids used this cinch sack type backpack for gym in middle school and high school, for after school activities, and for overnights at friends. They still pack their drawstring backpack for day trips and field trips where you need a jacket and a bottled water and probably a wallet. The colors on this backpack are gender neutral this year so the boys can feel comfortable carrying a black or navy backpack with their initials embroidered on the bag. Our monogrammed backpack patterns are adorable this year. This is our favorite floral pattern that current has a matching lunch tote available. This pattern will sell out, so order ASAP! We love this personalized backpack option for boys, what boy doesn't love sharks? Our quantities are limited on this pattern so order this backpack personalized with his name or initials. 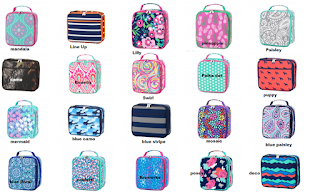 Look at this amazing selection of monogrammed lunch totes! Hello! This is a no brainer for moms who pack the lunches, she knows there are some days when the lunch tote doesn't make it home. Is it on the bus? Is it in the classroom? Is it on the playground? Did it get left in the cafeteria? There are literally a million places a lunch tote can end up, but a monogrammed one can be found and returned to you. Nobody else is going to assume possession of your child's lunch tote with your child's initials on it, so savvy moms know that getting the backpack and the lunch tote monogrammed is the biggest and best investment in new school supplies. 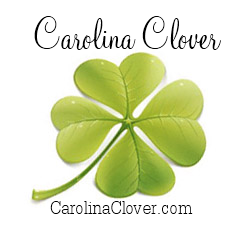 Carolina Clover, The Monogram Boutique has a complete web store loaded with backpacks and lunch totes that can be personalized with our commercial embroidery. Our retail store, located in downtown Wake Forest North Carolina offers a selection of backpacks and lunch totes. Our local customers can order online and ship to the store for free pick up. Our embroidery is on site in our retail store and we can even embroider backpacks that you bring us from purchased outside our store. We hope the kiddos and the parents have a great 2018-2019 school year! 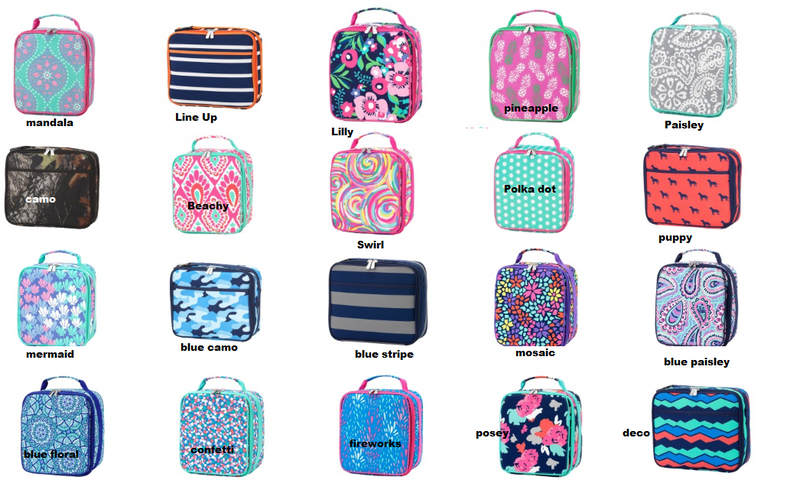 Personalized Backpack and Lunch Tote Sets! Summer School? Hardly not, just year around school getting ready to start in North Carolina! We're shopping school supplies in SUMMER! Stop in Carolina Clover, The Monogram Boutique and CarolinaClover.com for your new backpack, lunch tote bag and pencil case all personalized with our on site embroidery service. Savvy moms know that having a complete matching set of backpack, lunch, and pencil case is firstly the practical choice. Multiple kids getting out the door to school and activities? Matching bags per kid makes life easier. We love a monogram backpack or a personalized lunch tote bag for total practicality. How many times has a lunch tote or a backpack been left in the lunch room, classroom or bus? We like to think that these items will be returned to the owner with a name or monogram embroidered on them. It doesn't make much sense for these personalized items to get tossed in the lost and found or donation box. We all like to make a backpack buddies donation though! 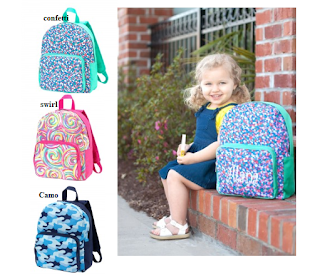 Carolina Clover is featuring our newest designs in personalized backpack sets for girls and boys. The new lines are out and are already selling out. If you find that the pattern you covet has sold out, there will be a restock of monogram backpacks and monogram lunch totes at the end of June. You'll love our floral, fish and stripes patterns! 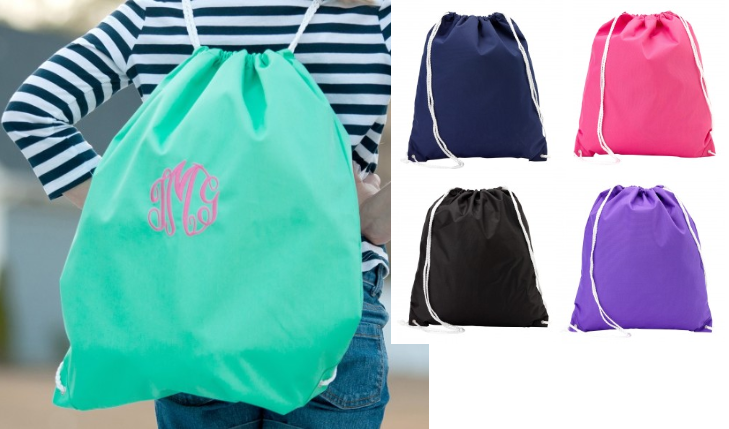 Don't forget to add on a drawstring backpack that is perfect for after school activities, middle school gym class or even an overnight to a friends house. Our kids love these drawstring sport bags and they have carried the same backpack for YEARS. Whenever it gets funky, we like to throw the bags in the washing machine and lay out to dry. Now that's quality. Can you do that with a bag from the box store? Probably not. Carolina Clover's monogrammed backpack sets feature the best in backpacks. You'll love the padded pockets, the folder size stow pockets the reinforced bottoms and adjustable straps you didn't even know you needed. Most of our backpacks are a full size for elementary school and up, but if you've got a pre schooler or a kindergartener, check out our small pre-school sized backpacks for these little tikes. We love the matching lunch tote and nap time blanket and your child will too. Don't run yourself all over town searching for all these items, shop Carolina Clover for all your back to school needs. 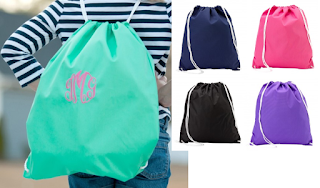 If you are local to Wake Forest, North Raleigh, Rolesville, Youngsville and Knightdale, consider stopping in our little monogram shop to see what we have stocked for you in the personalized backpack department. If you discover a bag you have to have locally or from Amazon, stop by our shop for embroidery service. Even if you don't buy the book bag from us we can personalize it for you inexpensively and we offer a 2nd day service. Don't wait until the last minute to get your backpack embroidered as our queue gets quite busy in August will all the traditional calendar kids going back to school. Whatever you do, trust your embroidery needs to Carolina Clover's professional and commercial grade embroidery where we can add a name a monogram or initials to your bookbags. We don't play around with our embroidery service, you get quality work with our professional embroiders that have been in business embroidering your daycare backpacks, soccer bags, backpacks and everything else for 9 years. Did you receive a graduation announcement? Do you need help in finding the perfect monogrammed graduation gift? Check out Carolina Clover's Monogrammed Graduation Gift Ideas to help you tackle the task of getting the perfect gift for your graduate. Whether your graduate is headed off to college, commuting to a job, or simply embarking on a vocational training there are many gifts that can assist with the new transition. Carolina Clover likes to suggest practical personalized gifts for the new living situations that the graduate will be transitioning to. In apartment or dorm living where all the rooms and facilities are shared, gift ideas like a monogrammed shower caddy or monogrammed towels are the perfect gift ideas. Items like monogrammed towel wraps and robes are essential for the new communal living situation. 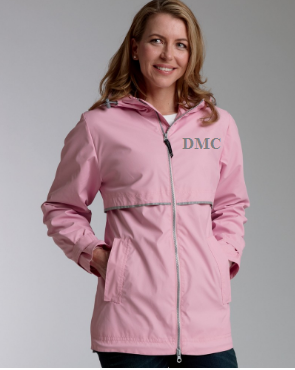 Other practical gift ideas include a good rain jacket or umbrella as they have to park and walk or just be out in the elements more than being on a high school campus. Going for the practical gift idea is a huge help to the parents who are adding up university expenses and if you can contribute a practical and useful gift, this amounts to less they have to buy the kiddo in supply shopping. Say your budget doesn't stretch to a big practical graduation gift we like to suggest to our customers a monogrammed tumbler with either a name or a monogram that's great for the ladies or gentleman. An etched tumbler is in the $30 range, but if your budget is even tighter or you have a bunch of graduates to buy for, we like to suggest a bulk group gift of a $10 tumbler from a box store and Carolina Clover can cut your monogrammed decal for you to go on the tumbler. Our in store customers are offered quantity discounts, so let us know if you have a bunch of graduates to buy for and we'll see what we can do to get your cost down on the tumblers. If a monogram tumbler doesn't seem like enough, we like to suggest to our customers that they fill the tumbler with cash, gift cards, or even candy kisses and hugs for the perfect graduation gift idea that is affordable too. Our in store customers like to bring us the linens they select for the dorm and we can embroider them right in our monogram shop located in downtown Wake Forest, North Carolina. Our turn around time is 2 days for items coming from outside our store. In store purchases from our monogram shop are completed same day or next day, which is why we are the perfect place to start shopping for your monogrammed graduation gifts. Monogram graduation gifts selected from our online monogram shop are quoted in the "availability" area of the product description. Please allow enough time for production and shipping if you are ordering from CarolinaClover.com. If you are ever in our area, please stop by our monogram shop that includes on site embroidery service and on site decal service. We also offer a selection of curated gifts that can be personalized. Once again the Yankees are invading the South, this time they are loving and staying in our Southern communities and really enjoying the flip flop weather and short sleeves for a good 9 months out of the year. Who doesn't? We welcome them with their Northern sass, fuggetaboutit! They love the slower pace, the Southern charm and the Southern class that is known on the Southeast Coast. Yankee South has captured this quintessential Northern Sass with Southern Class in a new lifestyle brand of tees, tanks and trucker hats and tumblers. The Yankee South shirts are the softest you'll find, our favorite is the "Hustle" tank in a flowy fabric with a racer back for ladies. You don't have to be from the North to HUSTLE! If you are from the North living in the South, the typical lifestyle brands don't speak to you, but Yankee South will. If you are proud of your Northern raisin' and your southern Livin' Yankee South is the new lifestyle brand for you. Our Yankee customers visit our monogram shop and comment how they love the Yankee South lifestyle brand. They get the T-shirt going, the Legacy Trucker Hat going, some hoops and some flip flops and you've got a new "Yankee Uniform". We joke in the shop that our big hoop earrings sell out every time we stock them and we've labeled them our "Yankee Hoops" because our northern customers love a good hoop earring with a trucker hat. If you're a Yankee in search of a brand apparel and graphic tees that speak to your heritage, check out Yankee South. They have way more apparel and accessories we've featured here. They are getting into more and more retail stores and will take the South by storm, y'all wait 'n see. Meanwhile, you can shop YankeeSouth.com online or you can also find them in our monogram shop at Carolina Clover, The Monogram Boutique in Downtown Wake Forest, NC. We are loving their social media, so follow them @theyankeesouth on instagram. Personalized Easter Baskets, Very Southern! The Easter bunny is on his way and will be arriving on Sunday, April 16, 2017! A little late this year, but we hope that the weather is warm by then in the south and the bulbs are in bloom! If you are searching for an adorable Easter basket for your egg hunt this year, shop Carolina Clover's sweet selection of personalized Easter baskets for bunnies of every age. Our favorite is the Southern Seersucker that sells out every year. Embroider this basket with your child's name or monogram, it makes a heart tugging keepsake. Store it in the child's room and use for storage if you're the practical one. Fold it flat and store it until next year, it takes up very little storage space in your Easter decor. Shown here is the green seersucker Easter basket personalized with an embroidered monogram. We've used a block R with a circle frame that is suitable for this adorable boy in his short tall. Our seersucker Easter basket comes in blue, pink, purple and green and is a single handle for the kids to be able to hold onto their treasures. You will love our price and our professional embroidery done right in our shop located in Wake Forest, NC. We happily serve Wake Forest, North Raleigh and surrounding areas with our professional embroidery service. Stop in the retail store if you are local and shop our on site selection of personalized Easter baskets that we can monogram for you the same day. If you're an online shopper, gather your orders and order in enough time to allow for production and shipping of your Easter basket. You can select your threads and fonts online and the style of basket for your little darlings. We can monogram Easter baskets suitable for boys and girls! Hey Guys! Are you looking for really cute Valentine's gift ideas for her that won't bust your budget? I mean you did just survive Christmas and you've had like 1 paycheck right? Carolina Clover doesn't disappoint with really thoughtful Valentine's gift ideas. They aren't cheap, and they aren't cheezy and they are really going to get you much kudos for creativity. Valentine's Gift Idea for Her #1. Pick a really sappy meaningful item. We really like a coordinates necklace, you can commemorate where you met, where you had your first date or where you got married in a cute little necklace that is under $50 delivered in either gold or silver. Expand on this idea, if you are not into coordinates, as in latitude and longitude, consider a state necklace if that means more to your relationship. Valentine's Gift Idea for Her #2. Pick a trend as a gift. She will be blown away that you even know what a trend is. The trends that we are seeing now are like blanket scarves, round beach towels, and anything with a tassel on it. If you see her on these trends, this is a good idea. If you don't see her on these trends, these are still a good idea because they are new territory! Valentine's Gift Idea for Her #3. Get her a new tumbler for her morning coffee, or her waterbottle for yoga and fill it with chocolate kisses or her favorite candy. CarolinaClover.com can personalize this tumbler for you with a decal and you can fill it with her favorite candy for a personalized gift for under $30. If you would like to see more Valentine Gift Ideas for Her, click over to our web site and shop our complete category of Valentine's gifts that she is sure to love for every budget. We carry really beautiful custom pendants as well as inexpensive engraved pieces. Let us know if we can help you find the perfect Valentine's Gift! Are you looking for chunky yarn for those fabulous blankets seen in only the high end home decor catalogs or have you drooled over the cozy warmth of 100% Marino wool blankets on Etsy? The meet newcomer Artizen Home to the ecommerce arena of movers and makers. Whether you are a knitter looking for the chunky wool yarn and supplies or you are an interior decorator looking for the latest trend in home decor, you'll find what you are looking for at Artizenhome.com. Celebrating their grand opening on September 24th, you will love their initial product offering of finished home goods and knitting supplies. They have stocked gorgeous Marino wool colors you can order by the pound or kit for the home crafter or professional knitter. We think they will dominate the market on domestic shipping in the United States as the premier supplier of bulky Marino wool products. No more waiting tireless weeks to restock your knitting cupboard because your supplier is overseas. You can't get this stuff at your local craft store folks. Welcome Artizenhome.com to the ecommerce world when they open for business on the 24th, shop their selection of gorgeous and on trend colors. Our sources tell us they have been knitting, photohooting, videoing and uploading finished products into their brand new store like madness. Wishing the best of Luck to Artizenhome.com, now go shop, Y'all. 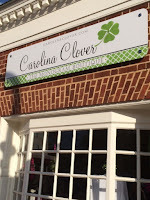 Carolina Clover, The Monogram Boutique is located in historic downtown Wake Forest, NC specializing in monogrammed jewelry, gifts and apparel.